Thomas Dunne Books, 9781250179456, 384pp. The New York Times bestseller! 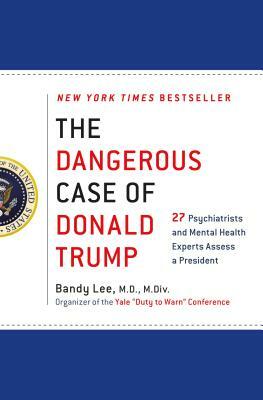 More than two dozen psychiatrists and psychologists offer their consensus view that Trump's mental state presents a clear and present danger to our nation and individual well-being. Bandy X. Lee, M.D., M.Div., is a Forensic Psychiatrist at Yale School of Medicine and a Project Group Leader for the World Health Organization Violence Prevention Alliance. She earned her degrees at Yale, interned at Bellevue, was Chief Resident at Mass. General, and was a Research Fellow at Harvard Medical School. She was also a Fellow of the National Institute of Mental Health. She has taught at Yale Law School for more than fifteen years and has spearheaded a number of prison reform projects around the country, including of the notorious Rikers Island jail of New York City. She’s written more than one hundred peer-reviewed articles and chapters, edited more than a dozen academic books, and is author of the textbook Violence. Robert Jay Lifton, M.D., is Lecturer in Psychiatry at Columbia University and Distinguished Professor Emeritus of John Jay College and the Graduate Center of the City University of New York. A leading psychohistorian, his renown comes from his studies of the doctors who aided Nazi war crimes and from his work with Hiroshima survivors. He was an outspoken critic of the American Psychological Association’s aiding of government-sanctioned torture, as he is a vocal opponent of nuclear weapons. His research encompasses the psychological causes and effects of war and political violence and the theory of thought reform. Gail Sheehy, Ph.D., as author, journalist, and popular lecturer, has changed the way millions of women and men around the world look at their life stages. In her 50-year career, she has written 17 books, including her revolutionary Passages, named one of the ten most influential books of our times. As a literary journalist, she was one of the original contributors to New York Magazine and to Vanity Fair since 1984. A winner of many awards, three honorary doctorates, a Lifetime Achievement Award in 2012 by Books for a Better Life, she has regularly commented on political figures, including in her acclaimed biography of Hillary Clinton. William J. Doherty, Ph.D., is a Professor of Family Social Science and Director of the Minnesota Couples on the Brink Project and the Citizen Professional Center at the University of Minnesota. In May 2016, he authored the Citizen Therapist Manifesto Against Trumpism, which was signed by over 3,800 therapists. After the election, he founded Citizen Therapists for Democracy. He is a Senior Fellow with Better Angels, an organization devoted to depolarizing America at the grass roots level. He helped pioneer the area of medical family therapy, and in 2017 received the American Family Therapy Association Lifetime Achievement Award. Judith Lewis Herman, M.D., is Professor of Psychiatry at Harvard University. She is a renowned Traumatic Stress Studies expert and author of the now classic Trauma and Recovery, which helped establish the diagnostic category of post-traumatic stress disorder. She is also Co-Founder and Former Director of Training of the Cambridge Health Alliance Victims of Violence Program, Distinguished Life Fellow of the American Psychiatric Association, and the recipient of numerous awards, including the American Medical Women’s Association Award and the International Society for Traumatic Stress Studies Lifetime Achievement Award. She authored a letter to President Obama requesting a neuropsychiatric evaluation of the then-President-elect Mr. Trump. Philip Zimbardo, Ph.D., Professor Emeritus at Stanford University, is a scholar, educator and researcher. Zimbardo is perhaps best known for his landmark Stanford prison study. Among his more than 500 publications are the bestseller The Lucifer Effect, and such notable psychology textbooks as Psychology: Core Concepts and Psychology and Life. He is founder and president of The Heroic Imagination Project, a worldwide nonprofit teaching people of all ages how to take wise and effective action in challenging situations. He also continues to research the effects of time perspectives and time perspective therapy. Rosemary Sword is codeveloper of Time Perspective Therapy and coauthor of The Time Cure (in English, German, Polish, Chinese, and Russian), The Time Cure Therapist Guidebook, Wiley, 2013; Time Perspective Therapy: Transforming Zimbardo’s Temporal Theory into Clinical Practice, Springer, 2015; Living and Loving Better, McFarland, November 2017; and Time Perspective Therapy: An Evolutionary Therapy for PTSD, McFarland. Craig Malkin, Ph.D., is author of the internationally acclaimed Rethinking Narcissism, a clinical psychologist, and Lecturer for Harvard Medical School with 25 years of experience helping individuals, couples, and families. His insights on relationships and narcissism have appeared in newspapers and magazines such as Time, The New York Times, The Sunday Times, Psychology Today, Women’s Health, Huffington Post, and Happen Magazine. He’s also been featured multiple times on NPR, CBS Radio, and the Oprah Winfrey Network channel, among other stations and shows internationally. Dr. Malkin is President and Director of the Cambridge, Massachusetts–based YM Psychotherapy and Consultation, Inc., which provides psychotherapy and couples workshops. Lance Dodes, M.D., is a Training and Supervising Analyst Emeritus at the Boston Psychoanalytic Society and Institute and retired Assistant Clinical Professor of Psychiatry at Harvard Medical School. He is the author of many academic articles and book chapters describing a new understanding of the nature and treatment of addiction, and the books: The Heart of Addiction; Breaking Addiction; and The Sober Truth. He has been honored by the Division on Addictions at Harvard Medical School for “Distinguished Contribution” to the study and treatment of addictive behavior, and been elected a Distinguished Fellow of the American Academy of Addiction Psychiatry. John D. Gartner, Ph.D., is a clinical psychologist. He taught in the Department of Psychiatry at Johns Hopkins University Medical School for 28 years. He is the author of In Search of Bill Clinton: A Psychological Biography and The Hypomanic Edge: The Link Between (a Little) Craziness and (a Lot of) Success in America. He practices in Baltimore and New York. Michael J. Tansey, Ph.D., is a Chicago-based clinical psychologist, author, and teacher. He is a graduate of Harvard University (A.B., '72, Personality Theory) and Northwestern University Feinberg School of Medicine (Ph.D., '78, Clinical Psychology). In addition to his full-time practice, he was an Assistant Professor teaching and supervising students, interns, residents, and post-doctoral fellows. He has been in private practice for over 35 years with adults, adolescents, and couples. The co-author of Understanding Countertransference, a book on empathy and the therapeutic process, he has written numerous professional journal articles as well as blog posts on The Huffington Post. James A. Herb, M.A., Esq., has practiced law in Florida for 40 years. He is a Florida Supreme Court certified circuit court mediator, and a certificated arbitrator. He is a professional member of the National College of Probate Judges. He is author of four chapters in Florida law practice books and has chaired or spoken at more than 50 legal seminars. Leonard L. Glass, M.D., M.P.H. is a psychiatrist and psychoanalyst in Newton, MA. He is Associate Professor of Psychiatry (Part-time) at Harvard Medical School and a Senior Attending Psychiatrist at McLean Hospital. Dr. Glass was President of the Boston Psychoanalytic Society and Institute and was a Distinguished Life Fellow of the American Psychiatric Association until he resigned in protest of the Goldwater Rule in April 2017. He has written professionally about the psychology of men, psychiatric casualties of large groups, and boundary issues in psychotherapy. He has also authored popular articles about spectator violence at sporting events and road rage. Henry J. Friedman, M.D., is Associate Professor of Psychiatry, Harvard Medical School, Part-time, on the Editorial Boards of Psychoanalytic Quarterly, American Journal of Psychoanalysis, and the Journal of the American Psychoanalytic Association, with main interests in the therapeutic action of psychoanalysis and analytic psychotherapy. Friedman is also Chair of the “Meet the Author” at the Biannual Meetings of the American Psychoanalytic Association. Diane Jhueck, L.M.H.C., D.M.H.P., has operated a private therapy practice for several decades. In addition, she performs mental health evaluations and detentions on individuals presenting as a danger to self or others. In a previous social justice career, she was a women’s specialist at the United Nations, in New York. She founded The Women’s and Children’s Free Restaurant, an empowerment project that has been in operation for 30 years. She founded the People’s AIDS Project and was an Assistant Regional Manager for Feeding America. She directed agencies addressing food aid, domestic violence, anti-apartheid, low income housing, and LGBTQ rights. Howard H. Covitz, PhD, ABPP has combined the practice of psychoanalysis in the suburbs of Philadelphia with a variety of other interests. He has taught university-level Mathematics, Psychology, and Biblical Characterology (1968-2011), was Training Analyst at the Psychoanalytic Studies Institute and Institute for Psychoanalytic Psychotherapies, and its Director (1986-1998). He also ran a school for disturbed inner city adolescents in the 1970’s. His Oedipal Paradigms in Collision (1998, reissued in 2016) was nominated for Gradiva Book of the Year Award. His connectedness to wife, grown children, and grandchildren motivate his writing and thinking. Betty P. Teng, M.F.A., L.M.S.W., is a trauma therapist in the Office of Victims Services of a major hospital in lower Manhattan. A graduate of Yale College, UCLA's graduate School of Theater, Film, and Television and NYU’s Silver School of Social Work, Ms. Teng is in psychoanalytic training and practices at the Institute for Contemporary Psychotherapy. She is also an award-winning screenwriter and editor whose credits include films by Ang Lee, Robert Altman, and Mike Nichols. Jennifer Contarino Panning, Psy.D., is a Licensed Clinical Psychologist and Owner of Mindful Psychology Associates, a small group practice in Evanston IL. She received her doctorate in Clinical Psychology from Chicago School of Professional Psychology in 2003, and completed trainings at Northern Illinois University and Northwestern University. Panning opened her private practice in 2004, and now has three psychologists and a postdoctoral fellow on staff. She specializes in the treatment of mood disorders, eating disorders, college student mental health, stress and trauma utilizing an integrative approach of CBT, mindfulness, and DBT, and is also trained in clinical hypnosis. Harper West, M.A., L.L.P., is a licensed psychotherapist in Clarkston, MI. She graduated from Michigan State University with a degree in journalism and worked in corporate communications, later earning a master’s degree in clinical psychology from Michigan School of Professional Psychology. Ms. West is the developer of Self-Acceptance Psychology, which challenges the biological model of mental disorders and offers a new paradigm that reframes emotional problems as adaptive responses to fear, trauma, shame, and lack of secure attachment. Her self-help book Pack Leader Psychology won an IBPA Ben Franklin Award for Psychology. Luba Kessler, M.D., is a psychiatrist and psychoanalyst in private practice. Born in the post-Holocaust displacement in the Ural mountains, she has lived and received her education in the Soviet Union, Poland, Italy, and the U.S. The journey included essential lessons in history, geography, culture, art, and politics. Post-graduate training and faculty appointments followed in psychiatry at Hillside Hospital on Long Island and psychoanalysis at NYU Psychoanalytic Institute (now Institute for Psychoanalytic Education affiliated with NYU Medical School). She is Editor of Issues in Education for The American Psychoanalyst of the American Psychoanalytic Association. Steve Wruble, M.D., is an accomplished singer-songwriter and storyteller. He won The Moth StorySLAM and uses a pseudonym to protect his privacy. Dr. Wruble is also a Board-certified child and adult psychiatrist in private practice in Manhattan and Ridgewood, NJ, at the Venn Center. He specializes in anxiety disorders, trauma, and attention-deficit hyperactivity disorders. He attended medical school in his hometown of Memphis, TN, and did his general psychiatry residency at Northwestern University. He then did his child psychiatry fellowship at the Institute for Juvenile Research at the University of Illinois at Chicago, where he was Chief Fellow. Elizabeth Mika, M.A., LCPC, of Gifted Resources in Northern Illinois (in the Chicago area) received her degree in clinical psychology from Adam Mickiewicz University in Poznan, Poland. She specializes in assessment and counseling of gifted children and adults. Her professional interests include creativity and mental health, learning differences and learning styles, multiple exceptionalities, and emotional and moral development of the gifted and not only. Dee Mosbacher, M.D., Ph.D., is a psychiatrist and Academy Award-nominated documentary filmmaker who was formerly on the faculty of University of California, San Francisco. As a public-sector psychiatrist, Dr. Mosbacher specialized in the treatment of patients with severe mental illness. She served as San Mateo County’s Medical Director for Mental Health and Senior Psychiatrist at San Francisco’s Progress Foundation. The Diane (Dee) Mosbacher and Woman Vision Papers are archived at the Sophia Smith Collection, Smith College. Dr. Mosbacher’s films are also contained within the Smithsonian National Museum of American History collection.